Likely owing to its great success, NORAD contracted Pennsylvania based Analytical Graphics, Inc. to lend the whole experience a greater taste of realism. 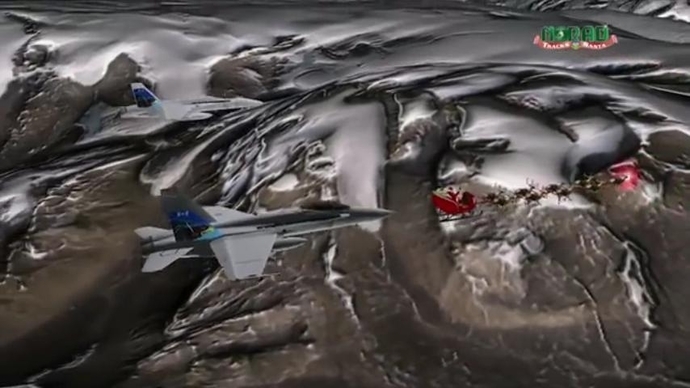 Changes to the program now include a depiction of missile armed fighter escorts flanking Santa Claus and his reindeer-driven sleigh. The “Track Santa” experience has been around since the 1950s, and was originally conceived by NORAD as a light-hearted way to showcase America’s Cold War capabilities to both track and intercept any potential threats to the country’s airspace, namely from the former Soviet Union. As web technology has developed, so too has NORAD’s Christmas time novelty, to the point that this year visitors will be shown animated segments of US military personnel preparing for Santa’s fictitious flight, or “Big Red One” when referred to by his call-sign. “It’s still cutesy since it’s for kids, but we don’t want people to lose sight of our true mission,” Davis tells the Boston Globe. In another sign that the US military is truly getting into the spirit of the season, White House national security spokesperson Caitlin Hayden even addressed whether Santa Claus’s fictitious flight would be avoiding China’s newly declared and highly contentious air defense zone. “I’m not empowered to speak for Mr. Claus, nor would his sleigh be subject to the same regulations as U.S. civilian airliners. As a general matter, the United States does not recognize the newly announced ADIZ, which appears to be a provocative attempt to unilaterally change the status quo in the East China Sea, a highly sensitive area, and thus raises regional tensions and increases the risk of miscalculation, confrontation and accidents,” said Hayden. Still, some child advocates are not sold on the military’s appropriation of the holiday experience, identifying the entire event as an opportunity to condition children early on. “What we have to remember is that the military has been hiring marketing companies for many years to best reach youngsters under 18 for the sole purpose of recruitment. They also know you can develop something called brand loyalty — from birth to death,” added Kanner. According to Davis, this year the “Track Santa” experience will be offered up in eight languages. Last year the website racked up an impressive 22.3 million visits, while a staff of 1,200 volunteers handled 114,000 phone calls.